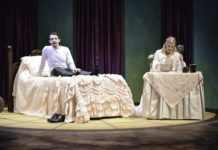 The University of Rhode Island Theatre’s production of Oscar Wilde’s “Lady Windermere’s Fan,” directed by Bryna Wortman, was witty and fun as it dealt with problems and drama just like we do today, only they did it way classier. As the lights turned on to a sophisticated living area I immediately was swept back in time to 1892 London. The set, created by Cheryl deWardener, was all hand painted, from the beautiful hardwood floors to the golden swirls on the blue walls. The costumes were everything I had hoped them to be, with more simple and light colored dresses for the younger women, and more sparkles and bolder dresses for the older women. The men all had, as J. Edward Clarke says, “penguin suits!” and these costumes, created by David T. Howard, really helped the audience solidify the world that Wilde had created. Of course, without anyone to play the roles the set and costumes would be for naught. 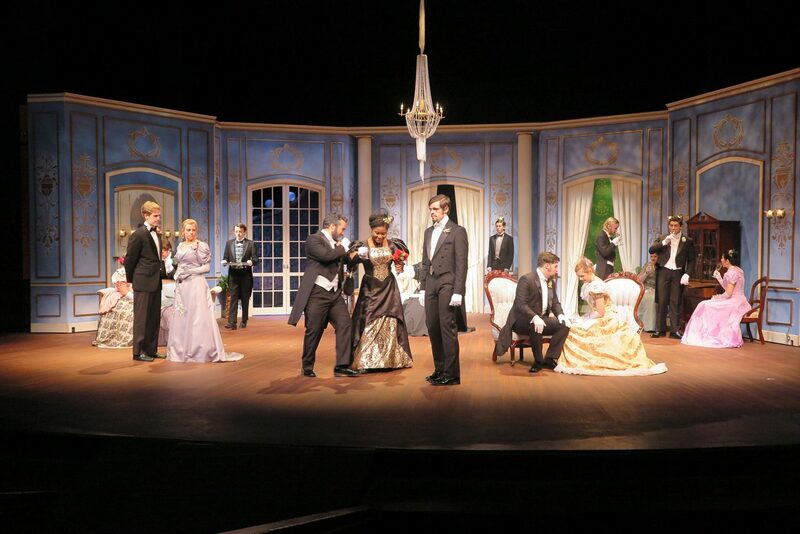 Fortunately though, Lady Windermere, played by Emily Turtle, soon makes her appearance as she talks to her friends on her birthday, from the handsome Lord Darlington, played by Daniel F. Greene, to the hysterical and no-nonsense Duchess of Berwick, played by Valerie Ferris, followed closely behind by her daughter. This show is about Lady Windermere, who is told that her husband is having an affair with a woman named Mrs. Erlynne, and although she tries her hardest not to believe it, it seems too true. Later, at her birthday party her husband invites the woman against her wishes, causing Lady Windermere to make a drastic decision. The audience soon finds out the Mrs. Erlynne is not who we thought her to be and the audience breathes a sigh of relief that Lord Windermere is a faithful and loving husband all along. As Mrs. Erlynne saves Lady Windermere from a tricky situation, the show ends back in the first room of the show and Mrs. Erlynne and Lord Augustus leave London, leaving the Windermere’s and a few kept secrets behind. I had interviewed some of the actors and actresses who performed in the show, and it was very fun talking about their characters with them. Speaking with Emily Turtle, J Edward Clarke and John T. Cunha, I asked them how they connected with their characters, and for Turtle, she said the toughest part of it was thinking of the etiquette of the time, what they wore, how they held themselves and how to be proper overall. 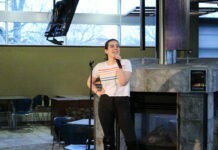 She also said that she admired Lady Windermere because she has always stayed true to herself, and she feels very strongly about what she believes in. Finally Cunha gave an excellent analysis of his goofy character, saying that because Lord Augustus is an older man, who has been divorced a few times, he has become sick of all the gossip, which Cunha says is funny because “everyone back then were just as bad as [we are] today”. All his character really wants is to simply find a good woman. Overall this play was beautifully told, through english accents, the beautiful costumes and set, and, of course, how the actors brought the story to life. The show still has one more performance on Dec. 10 at 2 p.m.